Abstract—Environmental design and quality has been known to have strong influence toward productivity and behavior. This research aims to discover the effect of Indoor Environmental Quality (IEQ) to human performance and discover the optimal combination of the IEQ aspects. This research also aims to examine human preference towards atmospheric cues to change their shopping behavior, in this case taking an example from airport shopping area. Combining both of these studies will draw a clear picture of the environmental design effect towards performance and behavior – which in this case is shopping behavior. Based on the research it’s found that temperature of 23.5oC, lighting of 500 lux and blue room color is the optimum combination in working environment, and store with in-store visibility, cool colors on window display, floors, wall and ceiling, and bright lighting for airport hallway is the preferred option in shopping area. Index Terms—Choice-based conjoint, human performance, indoor environment quality, purchase intention. The authors are with Universitas Indonesia, Indonesia (e-mail: suzianti@eng.ui.ac.id, jessicasuradi@yahoo.com, hutami.nadya@ui.ac.id, felisa.fitriani@gmail.com, mhd.faiq_ti2013@yahoo.com, nabilapriscandy@yahoo.com). Cite: Amalia Suzianti, Jessica Suradi, Hutami Nadya, Felisa Fitriani, Mhd. 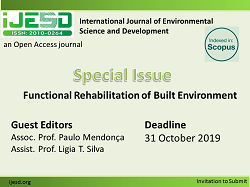 Faiq Pradilla, and Nabila Priscandy Poetri, "Analysis of the Environmental Design and Quality to Increase Human Performance and Behavior," International Journal of Environmental Science and Development vol. 8, no. 7, pp. 512-516, 2017.